As seen in "MythBusters: Red Rag to a Bull." 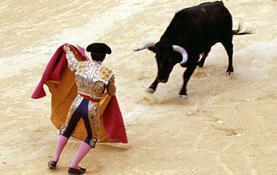 Explanation: Spanish matadors began using a small red cape, or muleta, in bullfighting around the 1700s. Ever since, it seems, people have perpetuated the color-charged myth that red makes bulls go wild. An 1,800-pound bull can hook a grown man with his horns and toss him 30 feet in the air, so the MythBusters set out to find a way to test this myth — carefully. They decided to put makeshift matadors into an arena, each holding a flag of a different color, and wait for an angry bull to see red. The red, blue and white flags got equal, half-hearted attacks when they were motionless. In order to elicit an aggressive charge response from the bull, the flags had to be waved.